This is the beginning of a new segment for S+S. It is called: Favorite Room Feature. 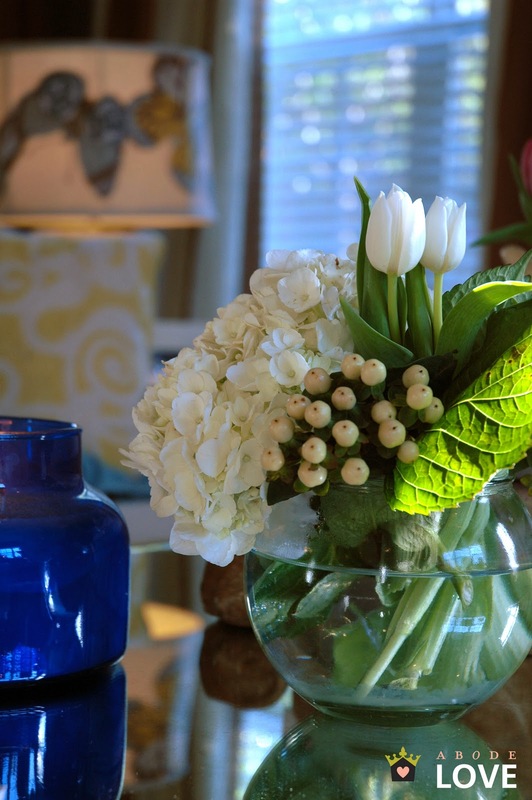 Each week, we will have a guest blogger featured and they will share with S+S readers their favorite space to decorate and why. They will show amazing before and after pictures of either their homes or a clients space. 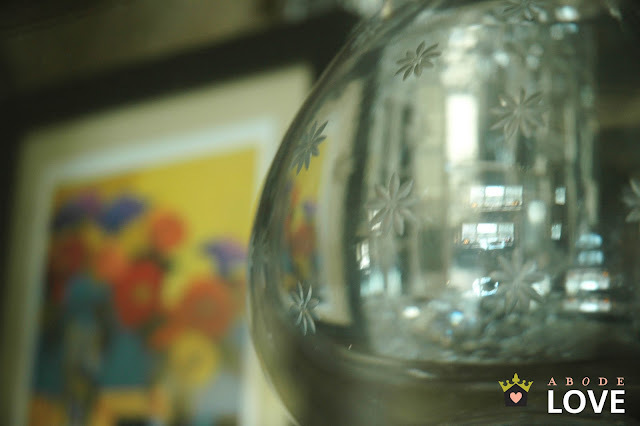 Without further adieu, our first guest blogger is none other than the fabulous Laurel-Dawn from Abode Love. We love her and her style so much and we know you will too. Hello Sadie + Stella readers! I am Laurel-Dawn, the blogger behind Abode Love. 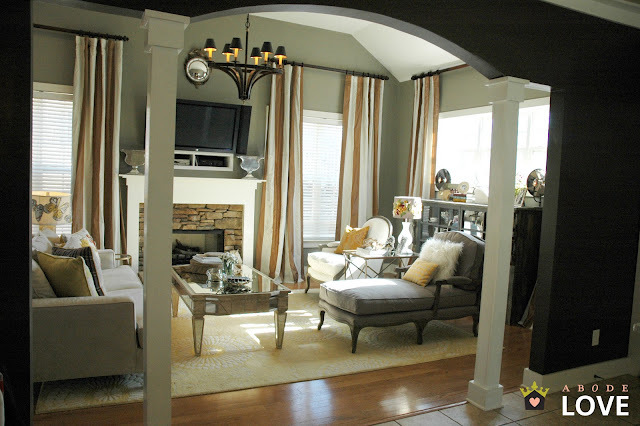 I am here to talk to all of you about my living room makeover. 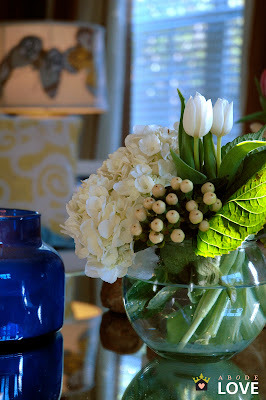 When my husband, Mister Husband, and I moved into our lovely abode... we had nothing. I mean, nothing. I purchased the coffee table and two leather chairs at a furniture closeout store- and I was so proud that I took this photo below.... Also, notice the two throw pillows. I am sure some of you recognize these guys from Target! 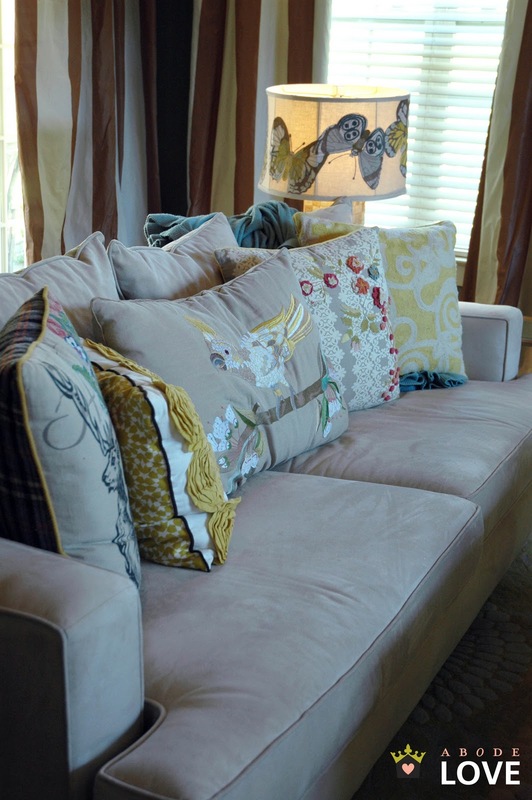 These gray and yellow pillows were the entire inspiration behind the whole space! 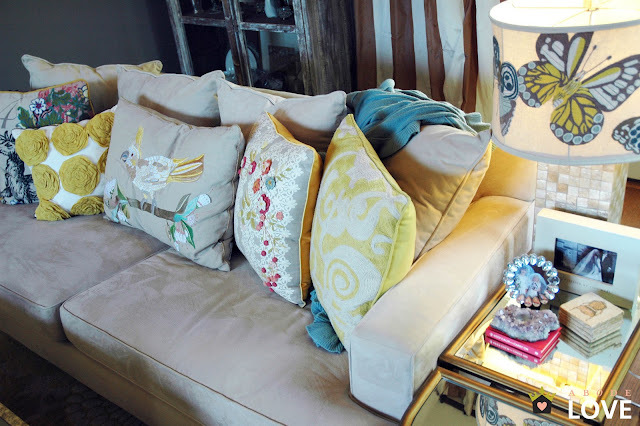 Next, we saved and saved for our sofa and received the yellow rug from Pottery Barn as a Christmas gift-- we also replaced the fan with this Overstock.com Murray Feiss light fixture. Then I got this AMAZING bull skull. And here is where we are as of now! I have learned throughout this process to splurge on large items like chairs and sofas... I am a believer in quality and comfort- and I couldn't be happier with the few big ticket items that I have purchased. With that said, I am also a HUGE believer in SALES! I have yet to purchase one single thing without it being on sale. I love discount stores, outlet malls and Overstock.com has furnished much of my home. 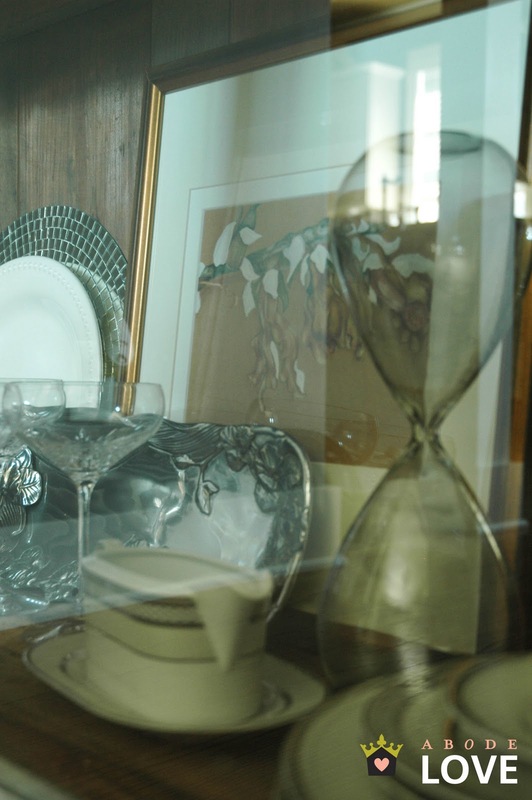 If you look often enough, you will find special pieces at a great price that you're proud to share with others! 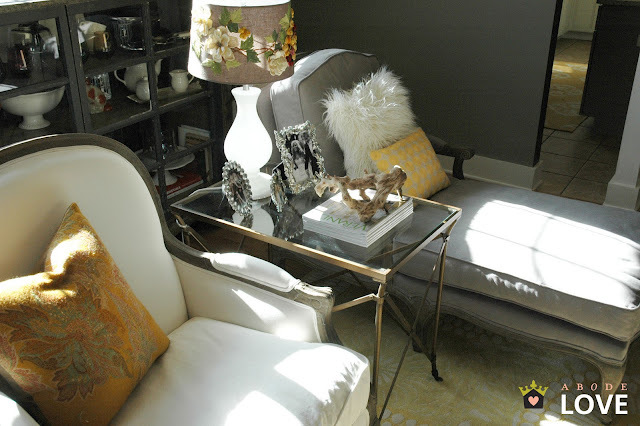 Not too long ago, I purchased this gorgeous pair (the Lyon chair and Tolouse Chaise) from Restoration Hardware to replace the leather chairs. There was nothing wrong with the leather pieces, we just wanted seating with arms and I wanted a look that was a bit more classic. I love the color and the soft look of these pieces. They're timeless and I believe that I will love them forever. 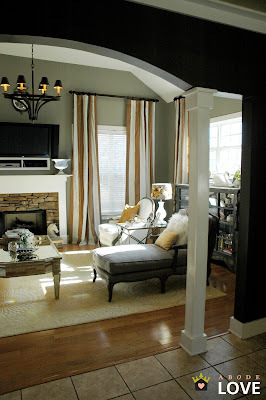 I also purchased brown and cream striped drapes from Overstock.com for just under $90 per panel! I have done a lot of research about drapes and these were a steal for sure... they're lined and 120 inches long! Wahoooo! 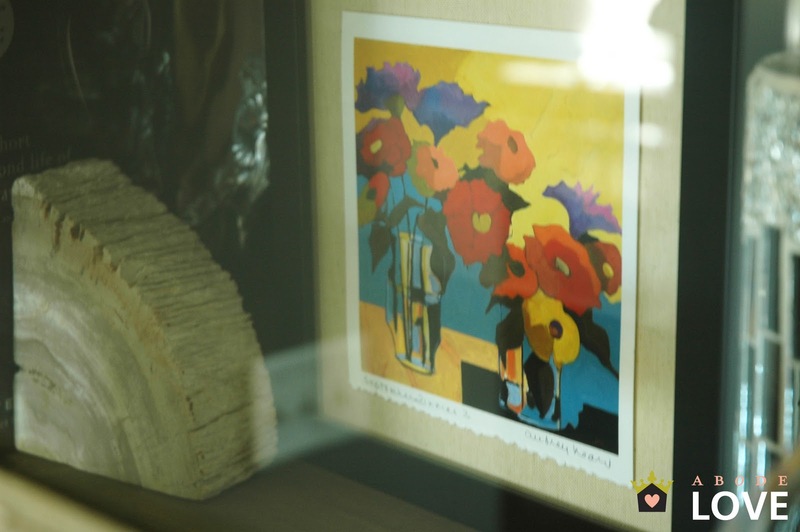 The piece that lies behind the chairs is built from reclaimed wood and an old glass paned door. 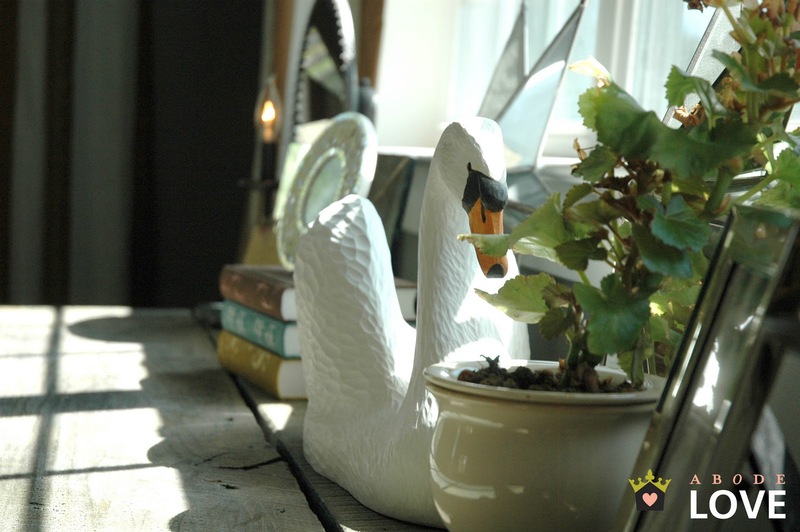 The swan is a prized possession of mine, my Grandpa hand carved it and painted it as a wedding gift for me, isn't it gorgeous!? These two little finds are from TJ Maxx... 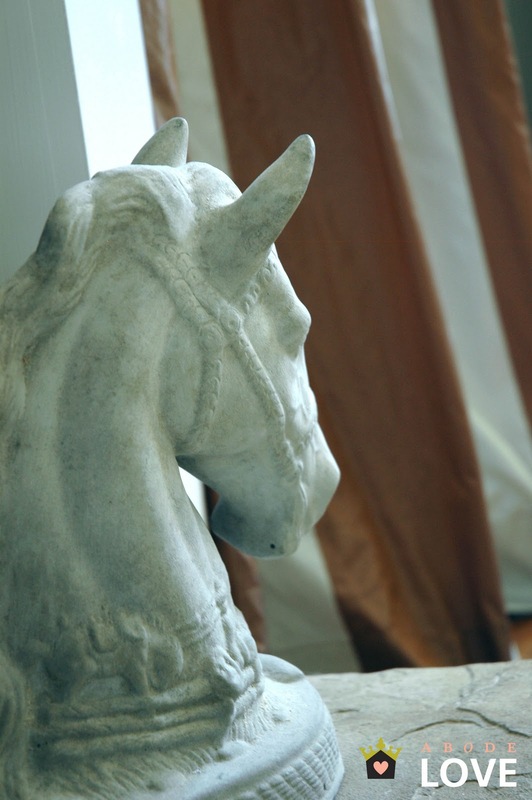 I love this dried coral- it brings in the yellow that is repeated throughout the space, and the cement horse head was a super special find, I love it. This little table was on clearance at Pier 1 a few years back for $39- it's a knock off... 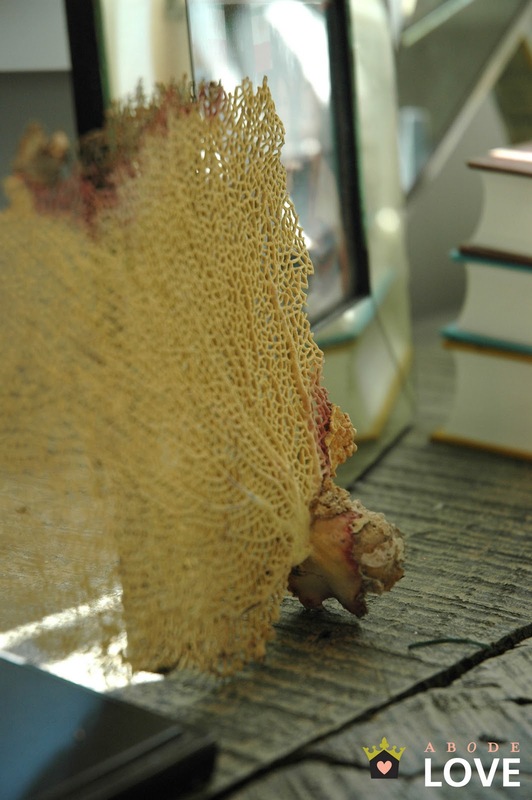 I just saw an identical piece in JLo's home (I don't think she snagged it from Pier 1!) Lucky me! 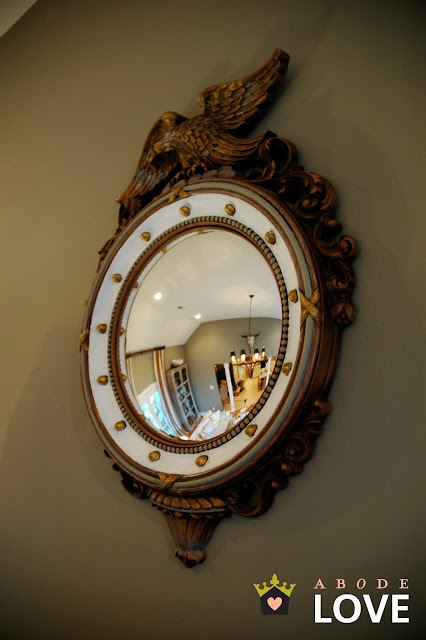 I snatched up this convex mirror from a local antique store in Birmingham for around $30 and I painted the white and gray accents. I am a lover of Anthropologie lampshades and pillows... can you tell? 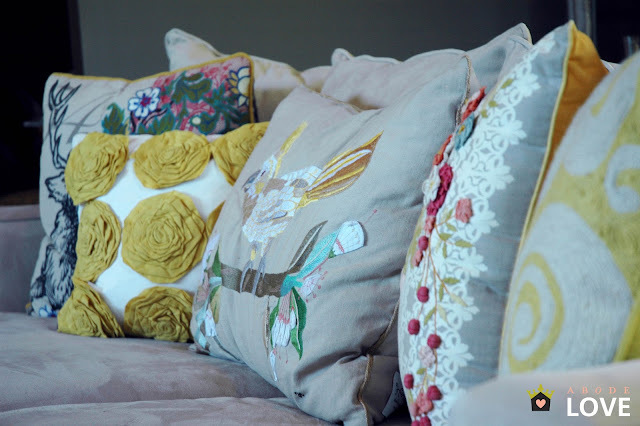 There's nothing like a great pillow to bring color and life into a space! 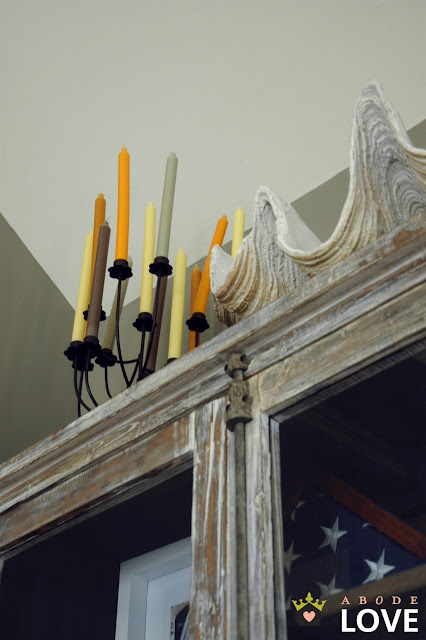 I filled this candelabra with tangerine, pale yellow and tones of gray candles- I love the pop of color that it gives to a corner of the room that wouldn't normally be of interest. I also am still loving the oversized shell trend.... I don't think this look will be going out of style anytime soon! 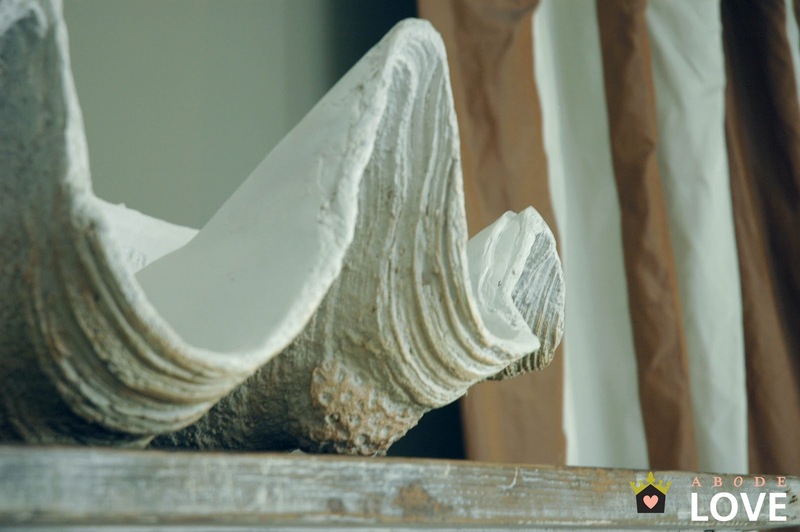 I love the undulating lines of this piece and the softness that it brings to the space. 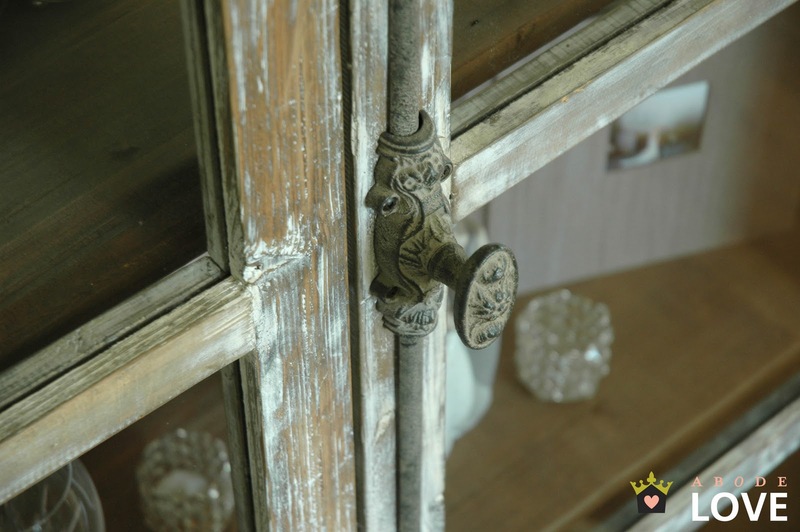 Here are a few close ups of my rustic Summer Classics china cabinet. The american flag that you see on the top shelf was a gift from Colonel Dad a few Christmases ago. 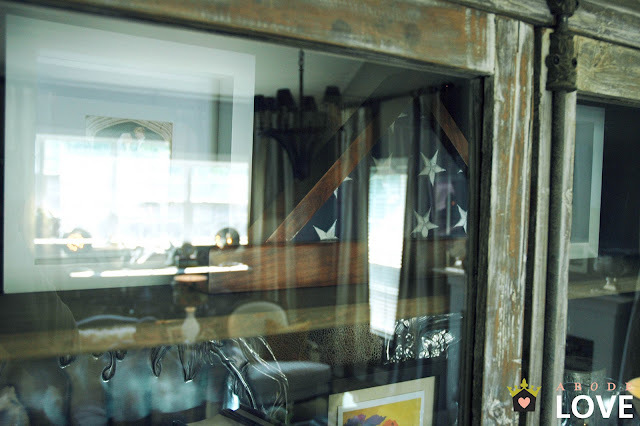 He made the display case and this particular flag flew with him in Operation Iraqi Freedom in 2003. It's a piece that is very dear to my heart. 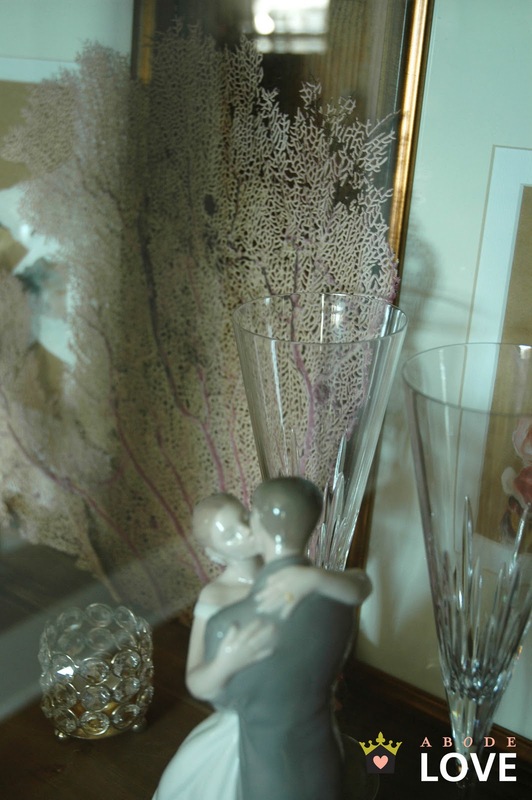 The Lladro piece in the photo below was used as our wedding cake topper... The artwork behind both images were pieces that I painted my freshman year at Auburn University. I love, love this print- it's beautiful! It's one of my favorite wedding gifts! I hope all of you enjoyed my living room and how it came to be! 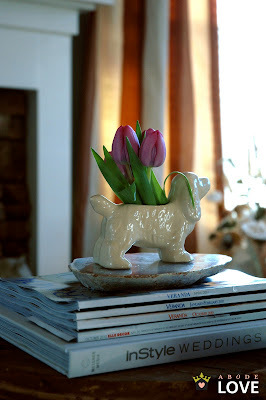 Thank you so much Sadie + Stella for featuring my abode on your fabulous blog! Have a great day and come and stop by Abode Love to pay me a visit! Beautiful home! I love all the attention to detail. It's so wonderful to have special pieces with memories behind them! How great! 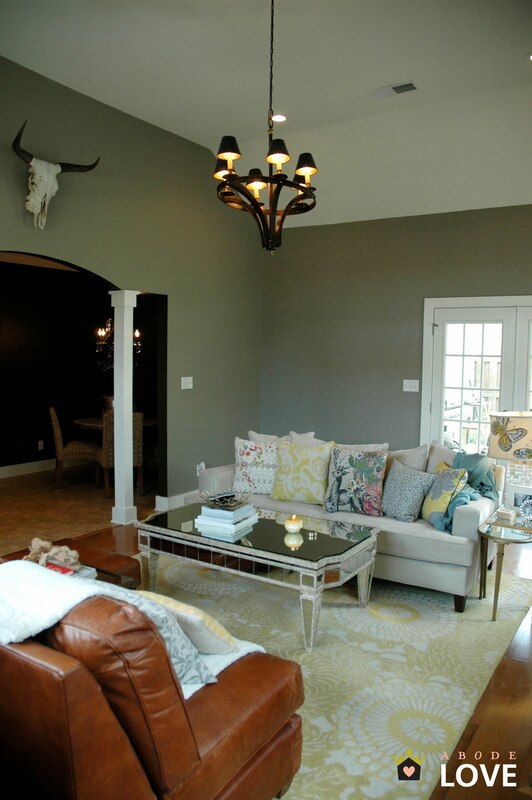 Wow - what a beautiful living room! I love seeing the before and after photos. What a beautiful room! I love all of the personal details, they really make a space. And your furniture pieces are amazing! I could mention about a hundred individual things I LOVE about this room. Everything is so beautiful--and I love that there are so many personal mementos. Laurel-Dawn, I just adore your space. Switching out those chairs was truly a genius moment. Now it has this lovely sophisticated look. OH and being a pillow lover, your sofa is just calling my name! Laurel Dawn what an amazing transformation. I absolutely love it!!! Where did you get the coffee table? I am looking for something like this! It's so beautiful!! I love all the details. Absolutely gorgeous room! Love the details and the colors! An absolutely beauitiful transformation! 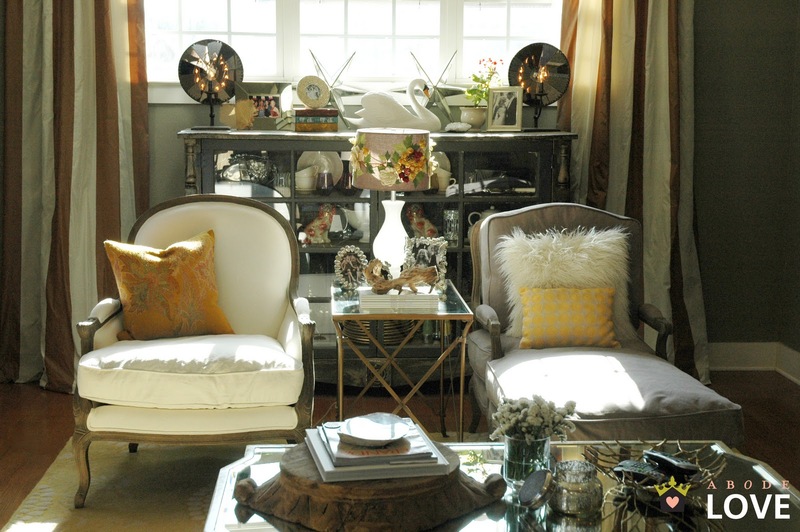 Love all the details in your living room! Such a great space! Hi, what color paint is on your walls? Love the space!